Got text working. Mostly like what I wrote above, but slightly different. There were some complications but I got around them in the end. The worst was the fact that the fonts have to be loaded, and that happens concurrently with the page itself being loaded. Therefore, you can't know that a font will actually be available when you try to use it. I postponed the initialization function calls until the fonts are loaded, so we can use them in the scenario initializers. This does create a delay before the page shows to the user. You use the factory object to create a 3D text object. It works just like a Particle, but we have a few more methods we can use and we also lost a few methods that apply to particles but not text. You can also use some constants: PIM.HELVETIKER, PIM.OPTIMER and PIM.GENTILIS. Similarly, for the style, we have: PIM.PLAIN and PIM.BOLD. For more information on what properties you can use, see the THREE.TextGeometry class. Remember we are using r88, so look at the documentation for that version. There is a default material and all text created will use the same material object until you call newTextMaterial. Then all subsequent text will use that material. This means that they will all change if that material object is changed. This can be used to your advantage but it can also cause problems. However, we can't use the velocity or spin methods because text is static. Fonts in space. Current output. Thanks for the addition, I hope it works. The output letter dimensions are aprox 10x10x4, much larger than the r=1 neutron surrounded with edge lengths (5,6,7,8,9 - I believe). One needs to change the view direction slightly to order to see the very large letters from this close - about 150. How do I limit the x and y values to four decimal places? But that's not my main complaint. Before entering any numbers, just clicking the parameters tab, it might take a minute before seeing the tab change. Entering numbers must be slow and careful, expect long delays. Pretty ugly first impression. I wasn't able to play with scaling the diagram size to match the font size because my browser slowed to near zero. I bombed Firefox Developer a couple of times, needing the Task Manager to stop Firefox. Did I do something wrong? Here's all the changes I made, so you could see what I did, but I did NOT push it to Bitbucket. P.S. Must clarify, I actually used 'var text = ... , and not 'text = ... , . No change in molasses. where 4 is the number of decimal places that you want. The text value will be a string, not a number (I think). Text is quite complex geometry, so if you have too much of it, it will slow things down. It doesn't seem like that is what you are experiencing though. I'm not sure why it would slow down before you even start the scenario. I don't experience that in my dev environment. This time I'm using Chrome, the scenario is still slow but it's much faster than Firefox. The console output messages are shown. I Pushed the changes to Bitbucket. I still need to shorten the numbers, etc. That's a weird violation warning to get since we haven't changed that file, and it isn't even ours. It may be that Chrome has been updated to now show that warning, but you are also seeing performance issues, so it seems that something has changed. Did you use a copy of OrbitControls.js from a different ThreeJS version? Negative. By the way, even though it's slow Firefox doesn't show any console warnings. I see the problem with either my testing folder's public_html test.html or my separate GIT files. I would have no idea how to replace OrbitControls.js without the Git application seeing the change. Which creates 2 temporary functions, doInit and wait. It then sets wait as the window onLoad event handler, so that it gets executed when the web page has loaded (all scripts parsed and the HTML is built into elements). When that happens, it will check to see if the fonts have loaded by calling PIM.isLoaded(). If that returns false, then it just call wait again after 50ms have transpired. If PIM.isLoaded returns true, then it calls doInit which will initialize the system like it did before, but we know the fonts are available. Maybe that is causing some issues. However, I develop in Chrome and test in Firefox once I upload to my site (which I don't often do for this project). I have not seen those warnings, but will have a closer look when I can. Maybe I missed them, but I doubt it because the console is always there to see. Even if that is not causing issues, it will cause slowdown during the initialization process, because it is waiting for those fonts. The fonts were another issue. Browsers don't let you just pull in code from anywhere. They limit you to the same domain that the page was loaded from or you get a Cross-site Scripting error. The fonts would not load unless you served the page from a web server. If you just double-clicked the HTML file to open it, they would not load. So I uploaded them to my site and linked directly to that. Therefore, it has to download them from my site when you load the page, which is a lot slower than if they were local files. This would create a Cross-site Scripting error, but I made a change to my web server to mark these resources as Cross-site allowed, so the browser is happy to load them. None of that would cause the violation message, but it will be causing some slow down during init. My previous posts included images of fonts in space displaying impossible to distinguish characters. Yes, we need to look perpendicularly at the text output. When text is viewed obliquely the letters/numbers become indistinguishable. I tried as you suggested, and added an orientation angle to go with the off-center text, but there’s no ideal angle. There’s always both x and y distortions. 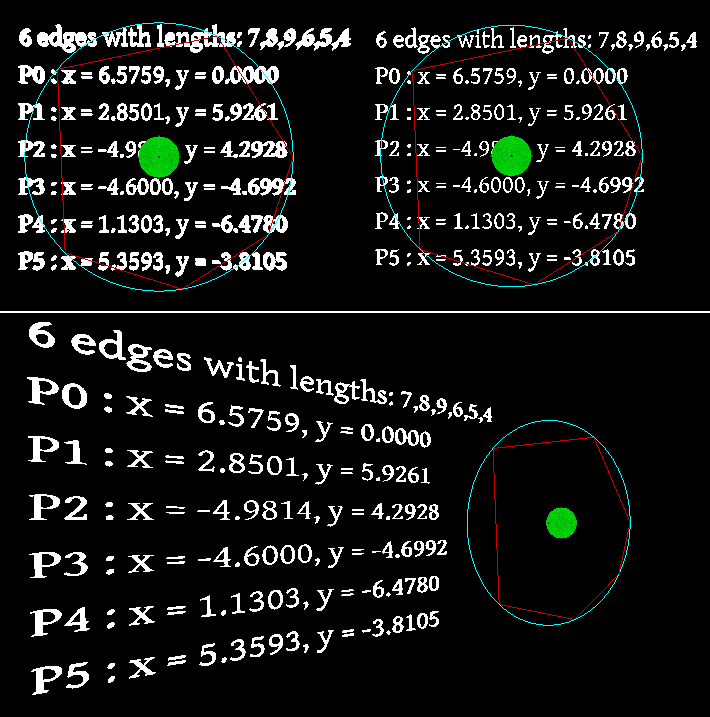 Ideally, the text should be placed on the inside surface of a sphere centered on the viewer at 0,0,0. I did a side by side comparison of the plain and bold, optimer, helvetiker and gentilis, 3d fonts. Gentilis has the narrowest characters, and is easiest to read. It’s clear the oblique problem is due to the fact that the font letters have a perpendicular thickness of about half their height. Does that 3d font source have flatter 3d fonts? Cyclic polygon output. The text is 200 units behind the circle and polygon, at the best viewing angle. I did warn you that this isn't the right way to show that sort of info. That stops the edges of the text from being smoothed, which also reduces the depth because beveling adds a bit to accommodate the rounding of the edges. But you will never get away from the 3D nature of it. 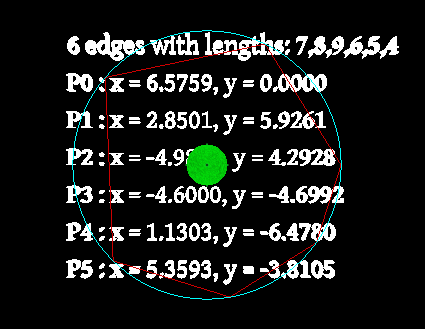 The problem: for a given set of edge lengths, provide the user with a cyclic polygon radius and output coordinates. You’ve explained that the console is not intended for normal users. The only other option I’m aware of is 3d space fonts, which you’ve provided, thank you very much. I’ve got the cleanest font selected (gentilis plain), and you’ve identified the way to turn the font beveling off - the font thickness went from 4 to two. The above shows the comparison. The top left image has font beveling, when viewed at even a slight off center angle, the font’s characters soon became indistinguishable. The bottom image shows the oblique viewing problem is gone, the scenario even seems to run a bit faster without beveling. Yes, 3d fonts are a pain, but I consider the improved output above as perfectly acceptable. I don't see what it is you're trying to do, or at least, it doesn't fit in this app. What I see is intermediate information needed by a developer as they solve a larger problem. I don't see what the user gets out of it or why they would come to a particle simulator to see cyclic polygon coordinates. Don't get me wrong, it is indeed an interesting problem, but the app needs to focus on what the user wants, not what we want. If you are solving this problem in order to place particles around something, then that is what it should do. Not show the edges and circles. That is why I see it as intermediate information. It is what you need to know in order to know that the algorithm is working, but once you do, you need to move on to the next stage and do something with it. It is easy to lose sight of the end goal when you hit an interesting problem. I certainly don't want to tread on your enthusiasm or down play your accomplishments. It is great that you have solved this complicated problem, but you soon learn that in software development, most of the great things you do go unnoticed by the users. We all want to show off what we have done when we are proud of it, but only a select few will understand. Users are only impressed by what you do for them. Make their life easier or show them something interesting and they will love it. How you did it, or what problems you solved to do it, they really don't care about. And that is not the users fault, or the developers, it just is what it is. Most users just don't understand what goes into the apps they use, and really, they shouldn't. The developers job is to make the complicated easier. We take the stress away by dealing with it ourselves so that the user doesn't have to. So, in essence, I am trying to say that we need to think about what the app is, what it does and what the user gets out of it. That is the lesson I have learnt over the last few years working with you guys. I realised that I was building apps that allowed me to play with ideas and try things out, but they weren't very good for the user. Great for me, but not very good for anyone else. So I have been trying to focus more on the user experience and less on what I want to play with. I still get to do that as I develop the apps, but sometimes I have to let things go or let them fade into the background because they either don't work in the app or they are not the focus of the app. But you know what? The users love it. They don't want a million options they don't understand, they want clean and concise. They want the app to show them something that they find interesting without the need to mess with heaps of controls. I am certainly not saying that this scenario is not useful. I think it just needs to focus on placing particles rather than where they are being placed. Maybe re-word it as particle placement where you specify the straight-line distances between particles arranged in a circle. You could even have a similar scenario that lets the user specify the angles rather than the edge lengths. The end goal is setting up a scenario for the user to watch. The particle interactions are the main focus of the app, so the scenarios should reflect that. It may not sound like it, but I am impressed with what you have done. In fact, I am going to look over it and see if I can fit it into MBL for the rings. I looked into it at the time, but didn't want to get side-tracked on the placement issue when I was making progress on larger problems. Now I can go back with a working example and it will be much easier. Nevyn wrote. I don't see what it is you're trying to do, or at least, it doesn't fit in this app. Airman wrote: What's the practical limit - the maximum number of neutral particles in a spherical array - without overlap - at a given radius? Nevyn wrote: You actually sent me the link to the answer to that in the MBL thread: http://milesmathis.forumotion.com/t464p25-molecular-bonding-language#3694. Airman. I admit, my last words are definitely confusing. Even with particles of varying radii, spheres aren't edge lengths, the cyclic polygon wouldn't work. But by referring back to the cyclic polygon algorithm from the MBL thread, http://milesmathis.forumotion.com/t464p25-molecular-bonding-language#3694, that I had found for you specifically for use in the MBL, I gathered that you hadn't gotten it to work, and you didn’t want to say as much; well then, I had to try too. Nevyn wrote: It may not sound like it, but I am impressed with what you have done. In fact, I am going to look over it and see if I can fit it into MBL for the rings. I looked into it at the time, but didn't want to get side-tracked on the placement issue when I was making progress on larger problems. Now I can go back with a working example and it will be much easier. Airman. I like to think I got lucky getting the algorithm to work because of your help, read back over the thread for proof of that. Cyclic polygon was always intended for MBL and I’m glad to hear you’ll get around to using it as the practical tool it was intended to be. At minimum, consider removing the cyclic polygon from CPIM, and, if you’d be so kind, it may fit among your calculators. I’ll even clean it up to meet your calculator spec, if I may, as you wish. I don't think the particle size makes the algorithm useless. It isn't the size of the particles that are being used but the distances between them. Differing particle sizes would make it more complicated, but only slightly. That would be different in MBL, where the size of the atoms is what we are using to find the positions and angles. I might have helped a bit with programming constructs, but I don't remember discussing the actual algorithm itself. That is all on you. You did that. You implemented a complex mathematical problem and put it into the app. That's a great achievement, even if it doesn't stay in this particular app. Although I see no reason to get rid of it just yet, maybe not at all. That is a decision for the last stages of development, just before we go live. I have no problem saying that this algorithm scared me away when I looked at it. I knew that I could solve it if I put the effort in, but didn't really want to at the time. I thought it would take too much time to do, so left it for another day. I really am impressed that you got this working, and you should be too. I hadn't thought about adding a calculator for cyclic polygon placement. I'm not sure if it fits in there, because it will need to show something, not just give back the results and those results are a series, rather than a single value. Maybe it is a new breed of calculator, requiring a new page style. There are probably a few other algorithms that we have used in this app that could be made into a calculator too. The hosahedron algorithm and all of the others that I tried to use on the charge point locations. The reason it won't fit into the current calculators is that the pages for the calculators are generated. All calculators are specified in a database and then used to fill in the page dynamically, when you request the page from the server. Therefore, all calculators must be the same. Not in the equation they are using, but in the way they are specified and the way the page will use that data to generate the HTML and JS. So this type of algorithm needs a new way to define it and a generator to create the pages. It is something to think about. I might forget about it before I can get to it though, so feel free to remind me later if we haven't mentioned it in a while. I'm occupied with creating a Periodic Table of AML at the moment, which will be the start of the second level of apps built on top of my language series. Those languages make things so much easier. I want to capitalize on that and see where it goes. I've had the idea of a periodic table app since the early days of AV, and it feels so close now. Thanks for the praise; and thanks for the opportunities. Ok, distances and edge lengths being equal, the cyclic polygon scenario stands. Earlier today I added angles to the output table. I imagine I’ll complete this scenario as you’ve suggested, by placing particles at the user requested cyc-poly points as the initial particle distribution in order to observe the particles’ charge/gravity interactions. Distances must be greater than two. The lines and circle will be removed. I understand the current calculator format limitations; until there’s an actual cyc-poly calculator - I think it’s fair to allow the user to have the non-default option of displaying the table output at some discrete location (say behind the initial view). Of course, if you think that’s crass, I’ll wait for the calculator version before including a table output. The Periodic Table of AML sounds fine. Perhaps some elemental structure will become apparent in the forms of the AML codes themselves. Would you be happy with a modal dialog that pops up to show the information you want after the scenario has initialized, but before rendering starts? Then the user can click it away and it is not part of the scene. I might even be able to get it to show it in the dialog that the scenario controls are on. I could allow you to attach a function to a button and that function can make the calculations and show them in the current dialog. Thanks for the option, but I don’t think its necessary – reserving the right to reconsider the offer later. I think I’ve initially completed the new scenario, Particle Ring – Cyclic Polygon. I stand corrected, this scenario works much better than I expected. Not just cyclic polygons, any series of numbers translates to unique particle ring positions, inside or out of the emission field of an optional central proton. The example shown, 6 neutrons in hex formation about the central proton results from entering 6 tens as shown. 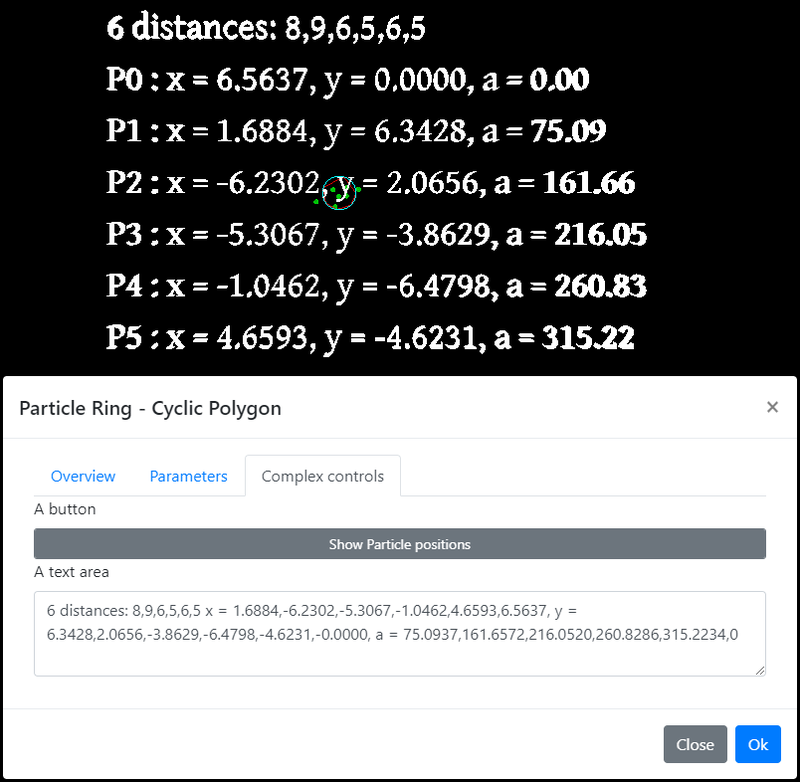 As you may notice, the table output (complete with circle, lines and central neutron) is a non default user selected option, located well behind the viewer and interacting particles. This scenario gives the user a lot of flexibility, especially good for viewing a wide variety of mainly 2D action, so I’ll place it at the top of the Spherical scenarios. I’ll Push it either later today or tomorrow before I change anything else. The same hex group as my previous post, this time from ‘behind’ (about z=-30) the particle ring (z=0) to the initial observation point (z=60). The requested output text is located discreetly ‘behind’ the initial viewpoint (z=300) with central neutron (z=305). When I said crass, I meant crass. 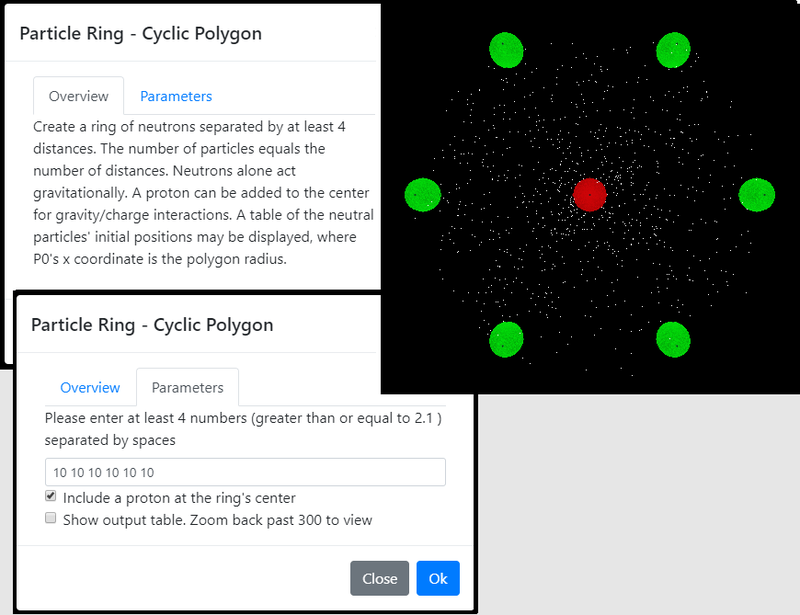 When I last posted, I was anxious to share the ‘new’ Particle Ring – Cyclic Polygon scenario – joy joy joy - so I didn’t try understanding, let alone replying to your offer. It occurred to me that the discreet output table may be an acceptable standard. Does the output table violate charged particle space to the point of objection? How does the modal dialog compare? To be perfectly honest, I’d be happy to try both for an honest comparison but don’t want you to waste your time. On the other hand, if the modal box works, we could ditch the existing 3d text. I'd say it was your decision. I'm still amazed that various number sequences result in such various outcomes. I think 3D text is not meant for this purpose. It is meant for 'in-world' viewing. That is, it is part of the scene that the user is interacting with. It is meant to represent actual text in the world, such as a McDonalds sign. Using it to show this kind of information just brings more problems than it solves. It is difficult to see as soon as you move the camera. Just look at the image in your last post, all of that text is unreadable. Well, you actually can read it, but it is not easy to read. I would prefer that this kind of information, if shown at all, is shown in the scenario settings dialog. A button executes a developer supplied function that will do whatever it needs to and then updates a control in the dialog. The developer must not require that function to be executed. It is just for the user to see, not for the code to use to retrieve data to set up the scenario. That is, the button and its function are optional, so you can't rely on it being executed. The developer will be able to create the button, supplying the function to be executed by it, like any other control. You also setup a control to show the results. Then you just need to implement the showCoordsFunction wherever is convenient. We can get into more detail after I develop the base framework. It should work something like that though. The results control is going to be a bit of a problem. There are so many options that one might want to use. I am leaning towards just providing a text area, which you can then populate with text as you want. This is simple, but not very pretty for some things. In your case, it really needs some sort of table, but tables in HTML are not a control like a text area or drop-down box, etc. I'll see if I can come up with anything that might work. I have added support for textareas and buttons, allowing many new things to be accomplished. A textarea is a multi row box for large amounts of text. I am typing this post into one at the moment. You can specify how many rows and/or columns the textarea will have by using some UI functions. In the current usage, a dialog box, the column value is ignored. Rows do work though. You can omit either or both values for rows and columns, any missing value will be determined at run-time according to the available space for the component. There are 2 other variants of the columns function that do the exact same thing, but are made available for their brevity. You can replace columns with cols or colms. I used both variants because cols is the HTML way of specifying it, but I am used to using colms when I use it in code. This way, I can get it wrong and it still works. The text will be available in the success function, just like any other control. Buttons are an interesting little addition that actually provides quite a bit of power to this framework. I did not intend it to reach this sort of functionality but we have found ourselves here anyway. My intentions be damned. They have some limitations as far as presentation goes, at the moment, but being able to attach functions that the user can execute allows you to change the other controls. For example, a defaults button could be created that returns all controls to their original values, or various preset values could be applied. If we want more functionality out of these buttons, I will look into a way to group them together into a toolbar. but that won't actually do anything. It will look like a button and the user can press it, but nothing will happen. We need to attach a function to the button that will be executed when the user presses it. Every time they press it. Notice how the calcText function is passed in to the button function. It does not have ( and ) so it is not being invoked, just referenced. It will not be executed here, but it will be attached to the button so that when it is clicked, that function will be executed. And ( and ) may be necessary. I don’t see how this option provides a solution. At present, the user enters a set of distances – we don’t even ask the user to identify how many; How do I “calculate” the number of rows, particles, and their coordinates? The code must be executed in order to build the output table. Please correct me if I'm wrong. I’m thinking a fancy (n rows by four variables and text) alert message will do. When the user presses the UI OK button, the program is executed, but before the action is displayed, the fancy alert message appears. Ok, I forgot about the array processing that will split the text value (the edge lengths) into an array of numbers for you (before the success function is called). In this situation, you would have to do that yourself. I will explain how to do that shortly. Airman wrote: How do I “calculate” the number of rows, particles, and their coordinates? You are already doing that in your success function. I would start by copying the ktCyclicPolygon function and removing all code that creates the 3D stuff and just create the text from the coordinates. That function will be what you pass in to the button method when creating the UI. Or you might have a small wrapper function that gets the values from the controls and then calls that function, passing the values in as parameters. You find the controls that you need values from using JQuery in conjunction with the ID of the control. The $ value is JQuery and it is a function which you can give a CSS Selector. If the selector starts with a #, then it will look for an element with the ID that matches the rest of the selector (assuming a simple selector, they can get much more complex). That works for things like text and numbers, but doesn't work for check boxes. They are a bit trickier, we have to check for a property called checked (which is a strange little beast as its value is irrelevant, only its presence matters). That should return a boolean value that you can use where true means that it is checked and false means that it is not. I don't think using an alert type of thing is a good idea because the user is already in a dialog box. Using multiple dialog boxes at the same time is frowned upon these days, because it can confuse the user but it can also get messy with the underlying UI. A modal dialog box, like what we are using here, stops the rest of the application from being interactive until it is dismissed. Having another modal dialog popup on top of that can cause issues with some frameworks. Look at the gravity.js file for an example of a button and a textarea being used together. Oh, and trust me, the ( and ) are definitely not needed in the context I was explaining. We don't want to execute the function at that point, we only want to pass it into the button method as a reference. It will only get executed if the user presses the button. Interim status report, half way there. Both the new output table and soon to be eliminated 3D particle field text are shown. The new output table needs some formatting changes, but all the values are present. 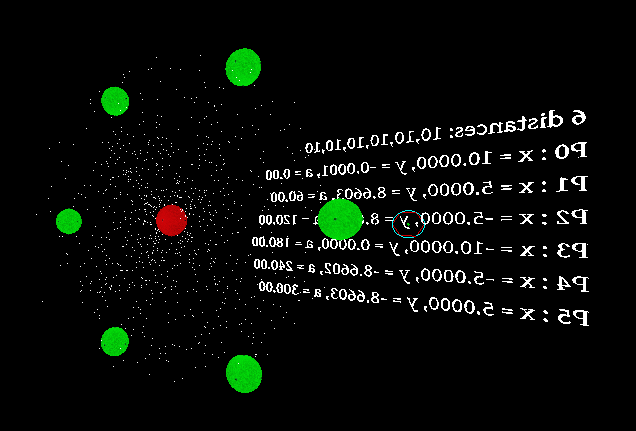 Here’s the latest Particle ring – Cyclic polygon, “Output control” tab. I do like this scenario. Your instructions worked perfectly. 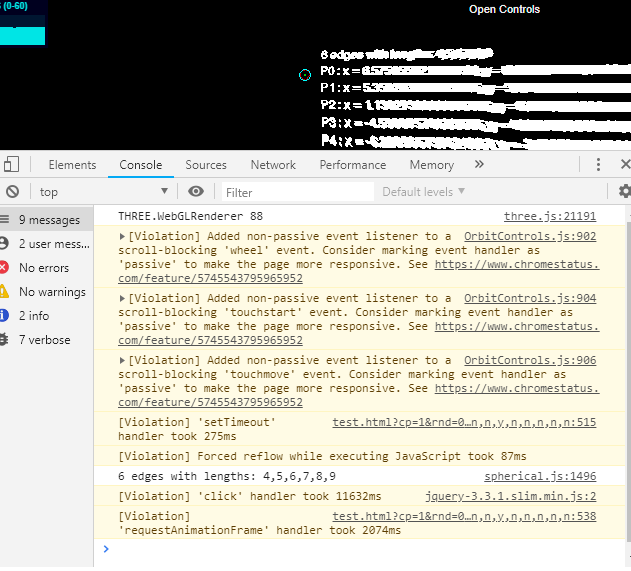 All the 3D text is gone, my chrome console is happy and I can go back to firefox again. With just four rows the table isn't as clear as the previous, I didn't see how to determine the number of particles and then output a new line for each position. For example, since I'm asking the user to decide whether to calculate the the output table, I see no problem asking that the user enter the number of particles, "for a better output table please input the number of distances/particles", then I believe I would be able to output a row for each particle instead of the current output table's total of four rows. Is there a way for me to use numbers.length to modify the Output control tab's textarea - perhaps with iterated calculate actions? I tried cleaning up the code – including deleting some original instructions. I'll create a single cyclic polygon function to replace the current separate cyclic polygon codes: one for the particle placement and the other for this new output table. On a separate subject, you may have noticed I started a new scenario - Particle sphere UI - intended to replace the set of spherical scenarios. I didn't get very far. No need to worry about the number of rows in the text area. It will add scroll bars if it needs to. When the function to calculate the coordinates is executed, the text area is already displayed and while it is possible to resize it, I'd prefer not to. Set it to a reasonable number to start with and let the user scroll for the rest. I'd say about 5 rows would be fine. I don't think it is a good idea to make one function out of the two variants you have. They serve different purposes and any attempt to bring them together is going to be messy and difficult to maintain. You could look for common code in both versions and try to find a way to extract that out so it can be used by each of them, but it really isn't necessary. You indicated the possibility of a poly calculator of some sort. I also mentioned I'm trying to come up with a Particle sphere scenario to replace all the current Spherical group's polyhedra choices. While I haven't exactly made any new progress, I've reviewed the EQS algorithm for generating particles on the surface of a sphere. That algorithm is an important part of our particle engine which you recently described as a complicated function in a function, or something like that. I'll try to describe it more simply, omitting a few unknown calculation details like measuring from area edges versus center of areas. EQS 132, 192, and 238. The EQS numbers indicate the number of radius = 1 neutral particles making up the surface of a sphere of radius 10. There are 130 particles on the surface of the 130EQS sphere. They are generated by the five pairs of numbers in the code below. The 1st number of each pair refers to the latitude of a hemisphere; the equator is at lat. zero, and the north pole is at 90 degrees latitude. Here we see 90deg divided by 5 lat sets, 18 deg apart. The 2nd number of each pair indicates the degrees between particles (c-c) at that latitude. Since each latitude has a different circumference, the total number of particles to fill each particle ring will vary. 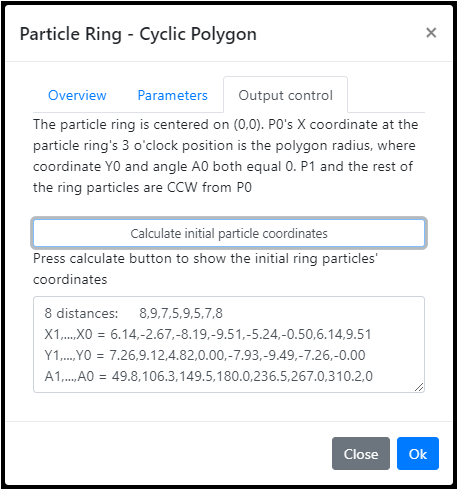 Comments have been added to show how each particle ring count is determined. The same pattern is repeated to create the southern hemisphere. The total particle ring set is - 3,9,15,18,20,20,18,15,9,3. [ 18, 18 ], // Lat 18. A particle every 18 degrees, 360/18 = 20 particles. [ 36, 20 ], // Lat 36. Every 20 degrees, 360/20 = 18 particles at that lat. [ 54, 24 ], // Lat 54. Every 24 degrees, 360/24 = 15. [ 72, 40 ], // Lat 72. 360/40 = 9. [ 90, 120 ] // Lat 90. 360/120 = 3 particles at the pole. [ 25.71, 15 ], // 24 "
[ 38.57, 15 ], // 24 "
[ 51.13, 18 ], // 20 "
[ 64.29, 24 ], // 15 "
[ 77.14, 40 ], // 9 "
I recall asking how many spheres of a given size might fit on the surface of a larger sphere. EQS130 seemed like a good standard at the time. Understanding the algorithm better, I was able to get to 238 without any particle overlaps. Mainly by adding 4 extra latitude rings (2 per hemisphere) - that is, if you wanted to add a new precision almost doubling Overdrive. PS. Must correct spelling (oarticle) error.